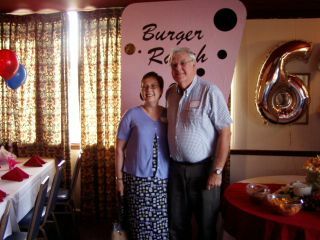 Roger with wife Mary Ann Swinford at the 40th reunion. I still live in Plainfield, married Mary Ann Swinford, PHS Class of 1965, and we will celebrate our 38th wedding anniversary in August. Mary Ann and I have 4 daughters, Laura and Emily, who live in Plainfield, Cathy who lives in Zionsville, and Sara who lives in Fishers. All of our girls also graduated from PHS. We have a total of 8 grandchildren - 6 girls and 2 boys. Next year when our granddaugher, Heather, graduates, the third generation of our family will be PHS alums. In December 1993, I retired from Eli Lilly after 30 years and now work part-time for Stoops Buick in Plainfield - keeps me out in the community. Mary Ann works as a health care administrator for the American Health Network. We enjoy travel, especially to historical and Civil War sites.